This morning felt like the perfect time for some breakfast baking. The rain started in the wee hours and made it cold and dreary outside. And what better weather for baking than cold and rainy. 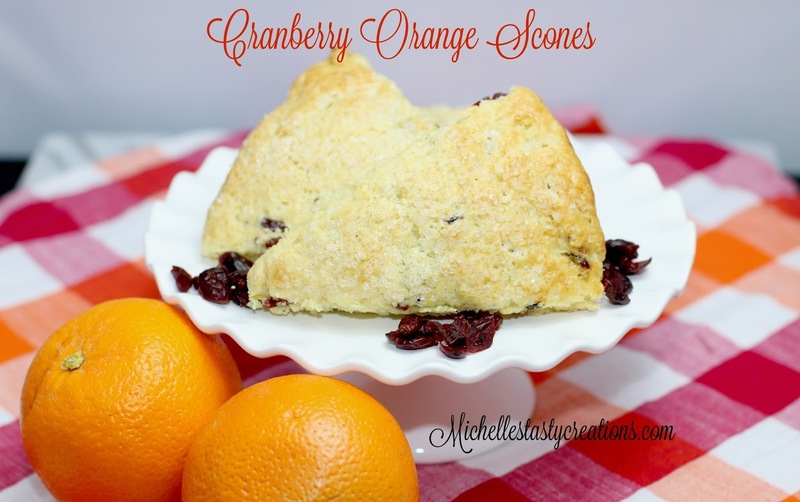 I have been in the mood for scones lately and have been perfecting my recipe over the last few days. I came across a recipe (not for scones but you'll see where I'm going with this in a minute) a while back that required cake flour and beings as I've never use it I bought a box and decided to give it a try. The one thing I can come up with is that it sure does make baked goods lighter and softer with a more tender crumb. It's my new best friend :) You know what that means right? More baking on the horizon! In a bowl mix the flour, sugar, salt, and baking powder. Add the cubed cold butter and using a pastry blender cut it in until pea sized pieces form. Make a well in the center of the flour mixture and pour in the beaten egg, cream, vanilla, zest and juice of one orange. Using a fork and a very light touch mix until the liquid is incorporated. The more you mix the tougher the dough. I usually only mix lightly until it just comes together. Add the Craisins and mix lightly. Using a knife or bench scraper cut in half, in half again and then cut each quarter in half again making 8 triangles. Brush with the egg wash and sprinkle with the sugar crystals to top. Bake for 20 minutes or until golden and done. Serve warm with your favorite beverage of choice.